Late last year (December 2016), an interesting academic research paper was released by the National Bureau of Economic Research – The Fading American Dream: Trends in Absolute Income Mobility Since 1940 – which provides stark evidence of the way in which this neo-liberal era is panning out and suppressing the opportunities for the least advantaged. One of the constantly repeating claims made by conservatives is that if governments run deficits they are really undermining the future for their children and their children. The claim is that while the current generation is living it up (deficits are tantamount in this narrative to living a profligate existence), the next generations will have to pay for it via higher taxes and reduced services.It is a bizarre argument given that each generation chooses its own tax burden and we cannot transfer real resources through time. There is truth in the argument that if the current generation imposes terminal damage to our natural environment then we are diminishing the prospects for the future. But that is not the point that the neo-liberals make. Indeed, there is a strong positive relationship between conservative views of fiscal policy (deficits) and the propensity to engage in climate change denial. 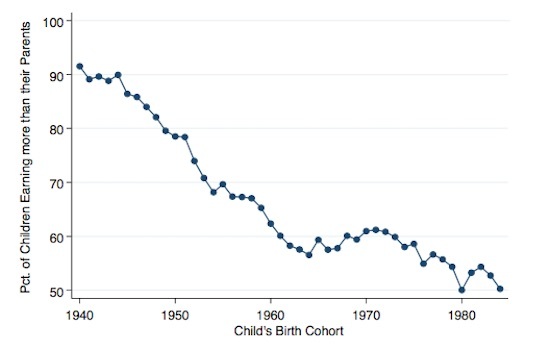 Recently released research is now showing that around 50 per cent of American children born in 1980 have incomes higher than their parents compared to 90 per cent born in 1940. The so-called ‘American Dream’ is looking like a nightmare. Other research has shown that the bottom 50 per cent of the US income distribution have not enjoyed any of the growth since 1980 and that the top-end-of-town has increased its share of income from 12 per cent in 1980s to 20 per cent in 2014. These shifts are the result of deliberate policy changes and inaction by governments, increasingly co-opted by the rich to serve their interests at the expense of the broader societal well-being. Revolutions have occurred for less. It was considered the norm of human progress that each generation would leave the next generation better off. As parents we would ensure our children were (collectively) better off. In his 2012 study of cultural history, The American Dream, Lawrence Samuel reprised the term introduced in 1931 by James Truslow Adams (in his The Epic of America). The two books should be read together to understand the evolution of the thinking about an American identity. Samuel reflected on the fact that “that the term ‘American Dream’ was created in the darkest days of the Great Depression was all the more interesting given that many feared it no longer existed”. Times were so bad for many during that period. Samuel published his book during the GFC, the worst downturn since the Great Depression. He considers there were six eras since the Great Depression marked by different characteristics and circumstance. But binding the social progress that defines the ‘American Dream’ was, in the words of the NBER authors the “ideal that children have a higher standard of living than their parents”. We think of our own progress relative to that of our parents. In recent history, the parents of the baby boomers had endured the Great Depression with it mass unemployment and rising poverty rates, then the Second World War and its aftermath. Reflecting on that experience, this generation worked through government to ensure there was full employment, broad rights of citizenship with respect to income support, improved public services and reduced income inequality through income redistribution. Wages growth was strong and proportional with productivity growth and mass education and public health improvements made obvious positive contributions to the growing well-being. The 1950s and 1960s were not nirvana, but they were a damn site better than the two decades before that and the many before those. Previous research has shown that US children (a result that transfers across most nations) are pretty much doomed from the start as a result of who their parents are and the resources the parents have at their disposal. I have written about this before. Please see – Parents are advance secret agents for the class society. The title of that blog came from the work of Dutch economist Jan Pen, who wrote in his 1971 book – Income Distribution – that public policy had to target disadvantaged children in low-income neighbourhoods at an early age if governments wanted to change the patterns of social and income mobility. The message from Pen was that the damage was done by the time the child reached their teenage years. While the later stages of Capitalism has found new ways to reinforce the elites which support the continuation of its exploitation and surplus labour appropriation (for example, deregulation, suppression of trade unions, real wage suppression, fiscal austerity), it remains that class differentials, which have always restricted upward mobility. This also means that as fiscal austerity has further pushed people towards to the bottom of the income distribution that increasing numbers of children will inherit the disadvantage of their parents and this inheritance becomes a vicious circle of poverty and alienation. In America, research has clearly shown that it is socioeconomic status rather than race which “largely explains gaps that appear to be due to race” (see cited blog for sources). It is very obvious now that the bias towards fiscal austerity, which has been the hallmark of the neo-liberal era has increased inequality and suppressed dynamic forces in labour markets that promote upward mobility. By failing to quickly end the most recent downturn (GFC) governments have allowed dynamic forces to multiply which reinforce disadvantage and suppress upward mobility. While unemployment has been high (and remains high in most nations), the great American economist Arthur Okun considered it to be the ‘Tip of the Iceberg’. Within this context, Okun outlined his upgrading hypothesis (in the 1960s and 1970s) and the related high-pressure economy model, which provided a coherent rationale for Keynesian demand-stimulus policy positions. Two references of relevance are Okun, A.M. (1973) ‘Upward Mobility in a High-Pressure Economy’, Brookings Papers on Economic Activity, 1: 207-252 and Okun, A.M. (1983) Economics for Policymaking, Cambridge, MIT Press. Which is one reason why the conservatives had to take control of the state, which had been acting as a mediator in the class struggle – to encourage upward mobility. The onslaught against full employment and the Welfare State (the hallmark of the social democratic era) began in the early 1970s as well-funded right-wing (so-called ‘free market’) think tanks started to publish a barrage of propaganda, infiltrated academic institutions, took over the mainstream media, and, even compromised judicial processes (for example, the appointment of Lewis Powell to the US Supreme Court). The upshot has been that once full employment was abandoned and governments adopted a chronic bias towards fiscal austerity (the belief that fiscal deficits are intrinsically bad), the upgrading benefits that used to accompany growth have been hijacked by the rich and the vast majority of the population now miss out. We are now starting to see the empirical results of this as cohort studies permit generational comparisons. Shedding light on what has been happening between generations is the task of the NBER paper cited in the Introduction. First, what fraction of children earn more than their parents today? Second, how have rates of absolute mobility changed over time? … the fraction of children earning or consuming more than their parents. They seek to answer these questions using “historical data from the Census and CPS cross-sections with panel data for recent birth cohorts from de-identified tax records” that allows them to uniquely bind parent and children incomes. I will leave it to your interest to explore the techniques they employed. They are very innovative. 1. “we find that rates of absolute upward income mobility in the United States have fallen sharply since 1940”. 4. The finding of a decline in absolute majority is robust across different dimensions (pre-tax, post-transfer; age of child when measured; regions, gender, impacts of immigration, etc). These are Trump’s ‘rust belts’ that he appealed to during the Presidential election. So you interpret it as saying that 90 per cent of children born in 1940 will on average have incomes higher than their parents, whereas, only 50 per cent of children born in 1980 will on average have incomes higher than their parents, and so on. … increasing GDP growth without changing the current distribution of growth would have modest effects on rates of absolute mobility. … a large fraction of GDP goes to a small number of high income earners today, higher GDP growth does not substantially increase the number of children who earn more than their parents. The key point is that reviving the “American Dream” of high rates of absolute mobility would require more broadly shared economic growth rather than just higher GDP growth rates. This research is consistent with studies in other nations. For example, see the analysis in my blog – Policy changes needed to arrest decline in fortunes for low-pay British workers. The point is that the neo-liberal era with widening income inequality, entrenched labour underutilisation, suppressed wages growth and continued attacks on income support systems is producing an unsustainable society. Eventually, there will be a counterattack as the middle class prospects continue to be eroded. While it might not come from the current generation, the children who are no coming into adulthood have been dealt a very poor hand by their parents. If the NBER research is correct, then 50 per cent of Americans born in 1980 (now in their mid-1930) are enjoying absolute mobility (relative to their parents), which brings into question the concept of the ‘American Dream’, a cultural device to maintain social stability and endeavour. It should not be forgotten that the parents themselves are under attack from this dysfunctional system and the prospects of growing intergenerational wealth through inheritance is becoming a faded reality for many families. Another perspective is offered in this paper also released in December 2016 by French economists Thomas Piketty, Emmanuel Saez and Gabriel Zucman – : Distributional National Accounts: Methods and Estimates for the United States. The paper examines the “growth rates for each quantile of the income distribution consistent with macroeconomic growth” in the US since 1913. So beware the middle-class. Your children are already losing out but neo-liberal is eating into the parental well-being as well as the financial capitalists prosper. This situation is obviously unsustainable. It is time for the Left to stand up and lead the way out of this mess. Growth and redistribution is needed. Governments have to take on the top-end-of-town. They can start by introducing employment guarantees that provide decent pay (with social wage additions) to anyone, thus eliminating the income insecurity. Then some serious regulation is required to rein in the financial sector (I would basically eliminate much of it). The Left are scared to say anything because, in part, their leadership is compromised by relationships with the financial capitalists (for example, the revelations about Hillary Clinton in the leaked E-mails), and, also, because they have a massive inferiority complex when discussing macroeconomics. They think if they argue that fiscal deficits are usually desirable and should be continuous they will look irresponsible. Well that is because they have allowed the public to be indoctrinated into these erroneous views. The Left has to launch a massive educational onslaught to redress this knowledge gap as they set about reversing the ravages of neo-liberalism. My blog is just a little pixel in the phalanx! The left need to come out and tell the truth. The FIRE sectors of the economy take the biggest slice of the pie and they contribute absolutely nothing tangible to society. The problem is that the majority of those supposedly representing the left / workers in this country don’t know what they are doing. Oxfam is a great example. They seem to have their hearts in the right place and all but always paint themselve into a corner by arguing things like the rich need to pay more tax … and so on. Oh my goodness Roger that was hilarious thank you. Dear Bill, who is “the left”? I see only scattered voices and I am fairly widely read. The old left is defunct. It turned into a right wing cohort with barely a space between the conservatives and the liberals. All Australia’s political parties are leaning right today. The old left sold out to neo-liberalism, and even the Greens are not measuring up. So I don’t think we can expect any political change, – just a lot of angry and frustrated voices trying to overcome the thicket of lies we are saddled with every day – before we crash the whole economy, which is an inevitability. At least Trump is openly lying and exposing the hypocrisy of the media and political class at the same time. An interesting if unexpected result. According to the graph, Bill, the percentage of children earning more than their parents decreases around the end of the war and levels out for a while from 1965 -1975 when it drops again. From the graph alone, one could be forgiven for thinking that the American Dream hardly got off the ground before it began to be ground into the dust. It is possibly worth noting that all the authors of the report bar one are from Stanford or Harvard. And he’s from UC, Berkeley. With the research funded partly by Stanford, Harvard, and the Gates Foundation. A good sign? The whole “upward mobility” concept is a red herring anyway and has always been used as such conveniently. For people to move (mobility) upwards, others have to move downwards, pro tip: is not usually the uber-wealthy who move downwards, more the ex-middle class. A n other misuse of language to shape social perception (“if you are not doing better is because you are lazy”). An other red herrings which is part of the “american dream” (or “capitalism is meritocracy” in other countries) theme and memes. Those memes need to die, they were non-sense in the first place. If we have set a social environment were we have manufactured zero-sum dynamics instead of increasing average wealth dynamics this is what we get, the system was no meritocratic in the first place for the most part and we do not need pandering into the status quo narrative to reinforce group think. “earning more than your parent” (adjusted to inflation) is a metric which can only go up if there is an aggregate increase of productivity and wealth while keeping distributional issues in check, however the concept of upward mobility will be often used to reinforce the narrative I described above. 1940 was a peak understandably given the 30s depression. It does seem odd that the bulk of the fall happens in the 59s and 60s. Why is that? I think that the year axis indicates, not when the upwards income mobility fell, but the year of birth. I’d say the left (the people) have shown exceptional tolerance and patience with the wealthy establishment funding the western political parties, who have used a variety of political methods to secure self serving policies, and who fail to grasp the indispensable component (the worker) to any functional society hoping to make good use of an economy. The better off on the left have become horribly infected with the same beliefs as the right leaning monied elite about some people being inherently more valuable to society and therefore justified in receiving a disproportionately larger share of the collective output than others. The divide between better educated “knowledge workers” , skilled trades vs less educated/skilled workers has grown into a canyon as people become intoxicated with elitist type thoughts on the superiority of their own particular brand of work vs another. There is a strong need for some sort of worker funded network to educate and develop solidarity among all workers that goes beyond unions who do not integrate and unite different types of workers, the unemployed/ underemployed, and are not international in scope. I can’t see a galvanised left political movement prevailing without such a backbone to hold the politicians on course against the will of establishment elites. Many neo-liberals share the sentiments contained in this blog – you don’t have to possess a left-leaning philosophy to hold the dream of increasing widespread prosperity, nor be a staunch capitalist to appreciate the gains from competitive markets. Achieving the two concepts simultaneously has invariably been spasmodic because both possess conflicting characteristics. Managing this conflict is a political challenge rather than an economic one, and that involves convincing the electorate about the correct policy and why some should bear the cost while others receive the benefit. Watching the elite rich become huge recipients of 30 years of largesse is finally producing a voter backlash that reveals itself, not in a dramatic swing to the left, but incredibly, support for advocates of the far right; reflecting no doubt a sense of general political betrayal; the shift in wealth may in fact be secondary. In the case of the larger than life US capitalist now encumbered with the task of redressing these imbalances, Trump has outspokenly said he will enact a series of measures aimed indirectly, if not head on, issues raised in this blog. Economists have been quick however, disparage his embrace of protectionism, many pointing out that such a policy will produce more costs than benefits. Certainly, from a practical point of view, many of those bearing an unequal share of the cost of protectionism will be impervious to the legitimacy of the cause and hostile to its imposition. One only has to recall the indifference of a large proportion of the UK populace to the claims of Arthur Scargill’s miners to see this evidence. So, while Trump’s tough rhetoric may elicit a grudging nod towards his bravado, it is the practicalities that may derail this mission. As an example of what form derailment might take, an article in theconversation.com/consumers-lose-out-to-australias-protectionist-anti-dumping-laws-62971 provides a readable perception. Describing the arbitrary identification of dumping, it shows the difficulty in using terminology like “a level playing field”, the bias towards domestic producers and how Fair Trade agreements can be compromised by what actually constitutes dumping. A further example, of anti-dumping measures against China rebounding on the Australian iron ore and coal industries provides a further insight into the ramifications of protectionism. Donald Trump’s headstrong mentality guarantees confrontation, perhaps sooner rather than later. His head is undoubtedly on the block. Nevertheless, he is fulfilling the hopes of a large number of American voters who were fed up with hearing about what was wrong with society and chose someone who had a vision of what was needed and a plan on how to implement it. Meanwhile trumps put a freeze on all non-military Public Sector hiring. With something like 45million unemployed/underemployed I’m completely failing to find the logic in that move. He’s talking about need to reduce waste and yet last I checked Wall Street was still there. Good points. I also agree that social mobility is overrated as a concept. We really need to change our goals to maintaining a decent standard of living for everyone as opposed to seeing life as a race with winners and losers. As an American I would rather see us have a real universal healthcare system and a less vicious work environment than the promise of more income and consumption than our parents. The stress of the rat race is not worth it but under our current system you almost have to be in the rat race if you want a shot at a decent life. That is why Americans are so obsessed with the “American Dream.” Obtaining middle-class status is seen as a must because otherwise you are in really bad shape due to our lack of a proper social welfare state. I’m European and in Europe there used not be such emphasis on “upward mobility” not long time ago, but you see this and related concepts pooping up more often as things get worse. Most people don’t want to “get rich”, they just want to have a “good life”, and if properly educated contribute in some way to society. This is how humans have functioned for the most part for thousands of years as long as “others” don’t get advantage of them. Widespread prosperity, education and peaceful environment achieve that. The push to destroy social institutions and spread the daily struggle through pushing private debt levels, removing social safety nets and undermining public institutions and civil society in Europe in the last decades have increased this obsession with “mobility” or “earning more than your parents” so i see where Americans are coming from, as we are heading the same way… unfortunately. IDG, Herman: The notion of “absolute mobility” seems to be defined in such a way that one person’s moving up does not entail another’s moving down. In principle, everyone can have a higher income than their parents had. Alan Dunn when upward mobility rates were at their highest so we’re the rates of taxes on the wealthiest. Bill, could you comment on, or point to posts on, reining in the FIRE sector.